(P1) Before I start, I must admit a personal interest. I have spent the past few months trying to buy a car here in Mexico, chatting to car dealers and friends about the best offers to be had. (P2) My research has proved FRUITFUL. Not only have I been able to purchase some wheels, but in doing so I have learned a thing or two about one of Mexico’s most successful industries – one that experts say brings in more foreign currency for Mexico than its oil. (P3) I took a flight to Nissan’s manufacturing site in Aguascalientes, an hour from Mexico City. Greeted by hugely proud employees in company jackets and baseball caps, I was BOMBARDED with statistics about the company’s success. (P4) One in four cars made in Mexico is a Nissan. And one car is made every 38 seconds at the plants in Aguascalientes. EVIDENTLY Nissan is enjoying a good ride at the moment. (P5) Nissan Mexicana’s vice-president of manufacturing, Armando Avila, says Mexico is a market that makes sense geographically. With the world’s largest car market to the north and all of South America below Mexico, it gives the company flexibility, he says. (P6) But as well as geography, Mexico has a reputation for a value-for-money workforce. (P7) According to the US-based Center for Automotive Research, WAGES can be as little as an eighth of what they are in the US. So is that what drives car brands to locate their factories in Mexico? (P8) Eduardo Solis, the man in charge of Mexico’s Automotive Industry Association, does not think so. (P10) Mexico has done well at training its workforce, and not just in manual labor. Engineers graduating from Mexican universities are also highly skilled. (P11) The numbers speak for themselves. So far this year, $5.5 billion dollars of investments in the Mexican automotive industry have been announced, including SUBSTANTIAL new investments by Toyota and Ford. (P12) But it is not just the MASS-MARKET car makers who are building their businesses here. (P13) Audi will be moving the production of its Q5 SUV from its HEADQUARTERS in Germany to its plant in Mexico. (P14) But as is so often the case, there is a DOWNSIDE to all of this success. Amid the rising production figures – the industry grew by 10% last year – demand for cars here in Mexico is not increasing much. (P15) Fewer than one in five cars made in Mexico is sold in Mexico. The rest are exported. In fact, at the Nissan plant we visited, 90% of the cars were being sent to the US. The other 10% to Brazil. (P16) Analyst Armando Soto, of Kaso & Associates, says the DEMOGRAPHICS explain why. (P18) The solution? SECOND-HAND cars it seems. But not just any old cars. (P19) Since 2006, when then-President Vicente Fox legalized the imports of second-hand cars from countries such as the US, more than seven million cars have entered Mexico. In total, there are about 22 million used cars in the country. (P20) The imported cars are what critics call garbage or junk cars. Often more than 10 years old and not ROADWORTHY in the US, they are sold in BULK at auction and come to Mexico for a NEW LEASE ON LIFE because there are fewer restrictions for cars on the roads here. (P21) While some would say it gives poorer people a chance of car ownership, Eduardo Solis’ view is that they have hugely damaged domestic sales, and his organization has been fighting to TIGHTEN the rules over imported cars. 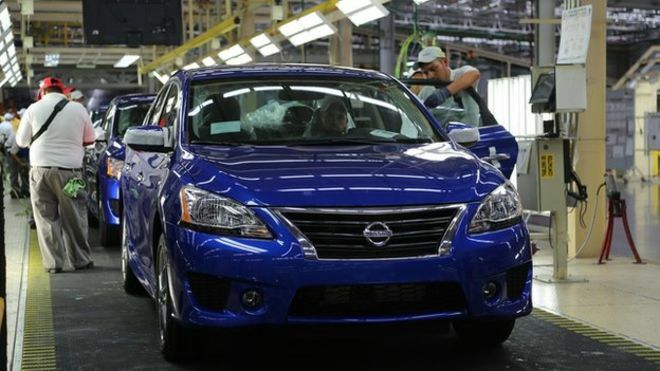 (P22) Back at the Nissan factory at Aguascalientes, production continues. (P23) There may not be much chance to sell these cars on Mexican soil, but this is an industry that is REVVING UP. What does Eduardo Solis think is more important to the success of the Mexican automotive industry – the cost of labor, or the quality of labor? Can most Mexican workers afford to buy Mexican cars? What kind of cars do they buy? Is Nissan actually a Mexican company? Where are most of the Nissan automobiles that are made in Mexico eventually sold?